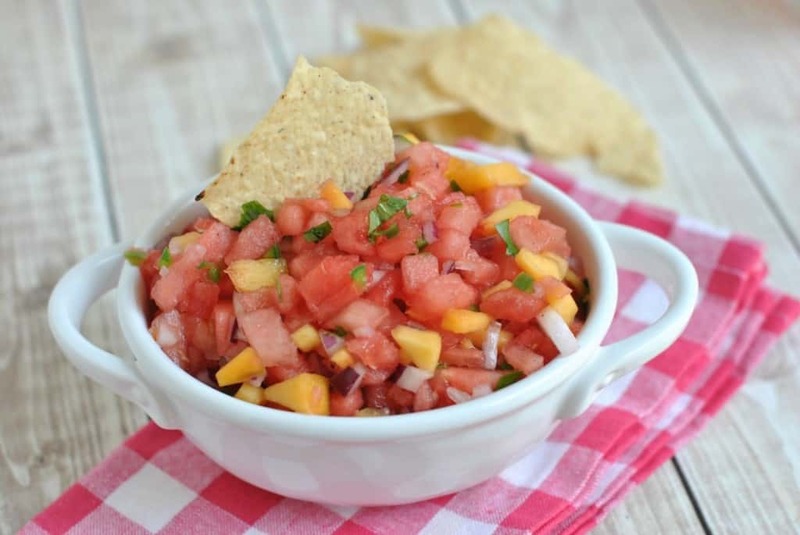 My love for the farmer’s market inspired this delicious Watermelon Peach Salsa. Pair it with some fresh Pure Leaf Iced Tea, and summer will never end. I hope. I have recently become obsessed with the local farmer’s market. The smells. The people watching. The “local” feel of supporting each other. The fresh fruits and vegetables. And the homemade hot empanadas. Oh the empanadas. I wake up on Saturday mornings thinking about them. Craving them. The farmer’s market fruits and veggies inspired today’s recipe. Well actually my friend Kim inspired this recipe. A few weeks ago she brought over a watermelon mango salsa. I was skeptical about the watermelon, but after one bite I knew I had to make this. Using my strawberry salsa recipe as a base. I got to work. And by work, I mean, went to the farmer’s market. I intended to create a watermelon mango salsa, but after walking around, I realized how insanely popular the peaches were. And after purchasing a big bag full, and tasting how sweet and juicy they are, I knew I would use peaches in my salsa. 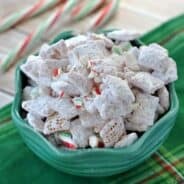 I am so happy with how this recipe turned out. 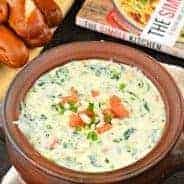 The fresh jalapenos and red onion give this salsa enough “kick” while the fruits give the heat some balance with sweetness. 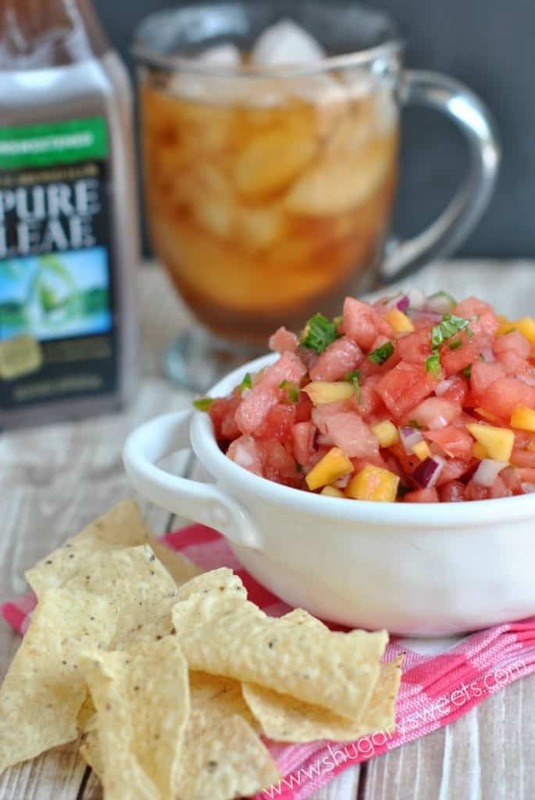 And of course, pairing this salsa with my favorite beverage (no, not coffee)…Pure Leaf Iced Tea made a delicious snack. I love the fresh brewed (never bitter) taste of the Unsweetened Iced Tea. Fortunately for me, my Costco sells this by the case! You may remember last month I made some Sweet Tea Slushies with Pure Leaf Sweet Tea. So refreshing! Help Pure Leaf Share the Love of Leaves! The real brewed iced tea brand has made a $100,000 donation to Wholesome Wave, a nonprofit that focuses on making fresh, healthy, locally grown food affordable and accessible to all, and now you can get involved and make a difference in your community by helping to bring Pure Leaf’s total donation to $150,000. For every social engagement from fans on Pure Leaf’s Facebook or Tumblr, and use of the #loveofleaves hashtag on Instagram and Twitter, Pure Leaf will donate an additional $1, up to $50,000, for a grand total donation of $150,000. This will help provide 100,000 pounds of locally grown fresh fruits and vegetables for communities nationwide. Let’s raise those numbers and max out the donation!! Will YOU help? Also, visit TheLoveOfLeaves.com for recipes, household tips, DIY projects and daily inspiration, all while keeping an eye on how the campaign donations add up! Refrigerate for an hour to let the flavors mingle. Serve with chips and enjoy! What a great idea! It looks really yummy! 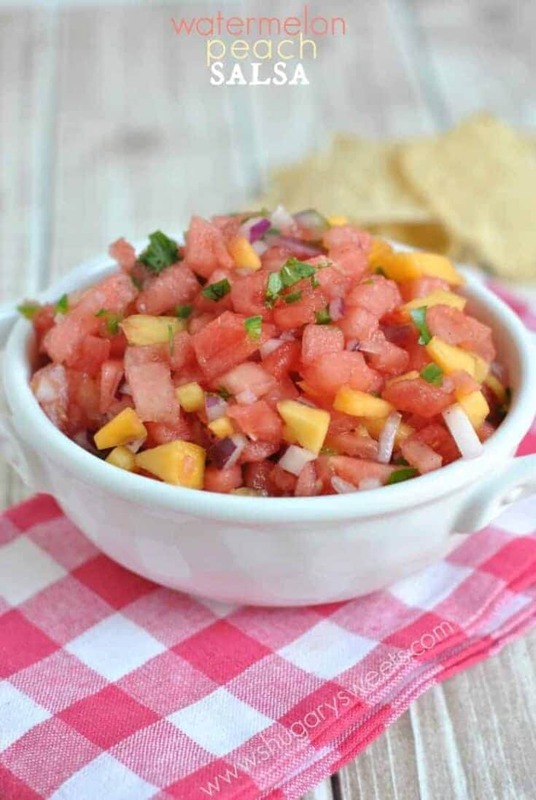 I love the idea of this salsa and wish summer didn’t have to end so soon!! Agreed, missing summer already. But sometimes I feel like I can “bring summer back” with summery recipes like this…even in winter. That and put up a few plastic palm trees. 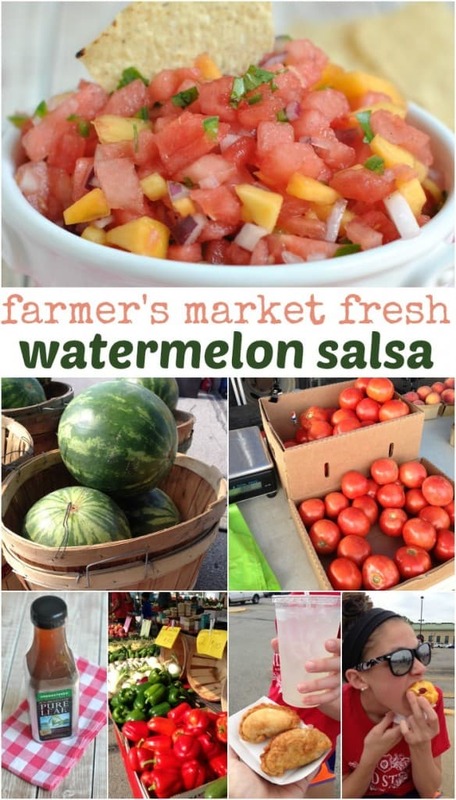 I have one more watermelon recipe yet this season because I accidentally bought this HUGE watermelon, I made some drinks out of it…I am LOVING this salsa, Aimee! I would babysit this til it was gone, all mine, done 🙂 Pinned! Oooo! This salsa sounds fantastic! I can’t get enough of peaches and watermelon this summer and this would be the perfect way to enjoy them even more! Pinned! Looks so light and refreshing! Lots of flavors! I could probably eat this by the spoonful, love the combination of fruits! Thanks Matt. This salsa definitely has the potential to be spoon eaten! Oh, so good…I just want to hold on to the salsa and summer flavors forever! This one is so great! I’m still trying to find a farmer’s market I love! Usually they are tiny with only a few booths, which is fine but then I don’t seem to find a whole lot of what I want. Never thought of pairing together watermelon and peaches, so I may need to hurry and make this before summer is over! We have two big farmer’s markets around here that we love. But usually only go to the one because of the empanadas. Yeah, they’re that good. I do love going to the Farmer’s Market for all the fresh fruits and veggies. What a fun way to dress up a salsa for those chicken and fish dinners! And that Pure Leaf Tea is really so good!!! I love fruit salsas! This looks so good! 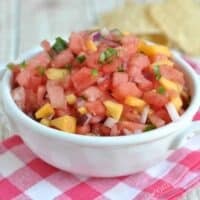 I’ve made fruit salsa lots of times but never thought to put watermelon in it! Sounds delicious! It’s SO hot here right now, this looks like the perfect, refreshing snack! Love the idea of spicy watermelon! This looks fantastic. I am loving the sound of this refreshing salsa! 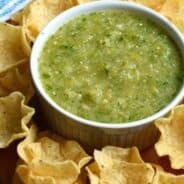 This salsa sounds like the perfect treat, especially since we’re having some sort of a heat wave here! Our farmer’s market is REALLY small and I’m pretty sure they don’t have empanadas. Sounds like a future recipe from you? Love the sound of this. My 2 favorite fruits. Not a fan of cilantro. Any substitutions?